When Xmas rolls around it’s nice to be a Guru. Those people that give presents tend to give candy, and when they’re thinking straight, they tend to give new candy that they think we haven’t reviewed previously. And thus we have Hi-Chew Bites, which, interestingly, I hadn’t seen before. Strange because I love Hi-Chew originals. A lot. I buy and re-buy. So how could I have missed these babies? When my lovely kid had me open her present, and these appeared, I was actually excited. I got cool shirts and other sundries for Xmas but this was something I wanted to dig into. 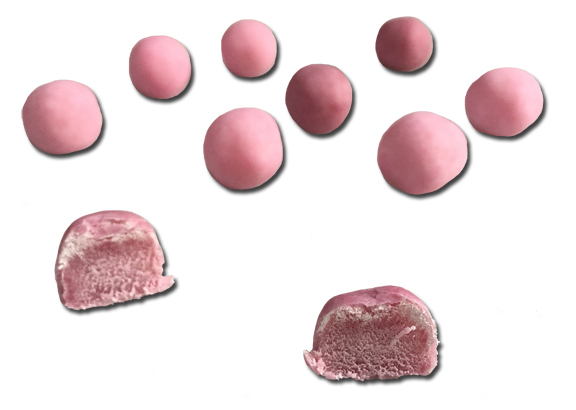 I love the original Japanese chews because of their density, the hardness of the chew, the size of the candy, and the deep flavor. How could these not be just as awesome? Um well they’re not. 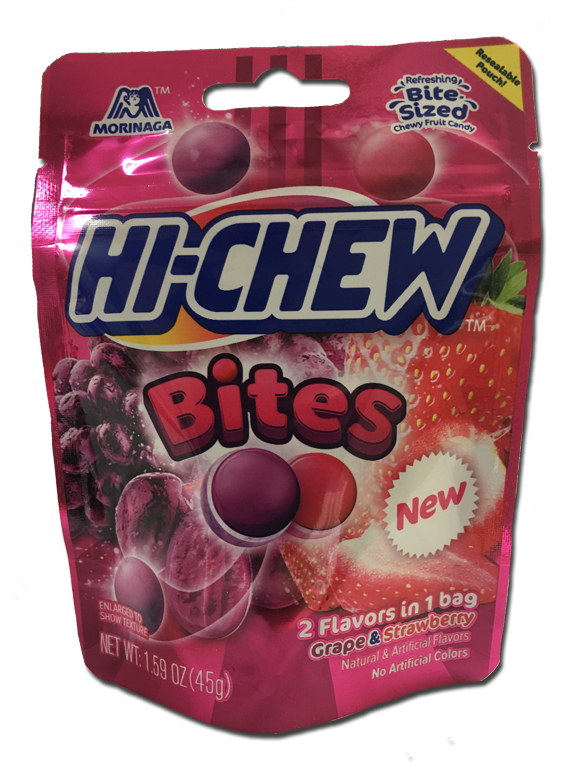 And if you are like me, these Hi-Chew bites will disappoint. First off, they are more like a gum ball. They break down fast, and it’s not a hard and fun chew either. Thankfully the flavors – in this case Strawberry and Grape – are way better than you get in most gum balls. Much brighter, fuller, more at the tip of the tongue with sweetness. Yet… these Chews taste artificial. I love fake grape, so no qualms from me with that one. But the strawberry tastes exactly like jell-o. Eeeks. What a huge step back from previous Hi-Chew types. These candies still have some of the positive Japanese candy-ness to them: the sweet and tart mix with an almost floral flavor is apparent but it doesn’t all add up to a great candy experience. I mean, take the ‘chew’ out of the Hi-Chews and what have you got?